The following is a translation of Hebrew material appearing in the Badatz Eida Chareidis Pesach Guide 5774 beginning on page 21. In this annual publication, the hashgacha includes a number of ‘horror’ stories in the hope of driving the point home – that everything we put in our mouths requires a credible hashgacha. This story takes us to a factory that manufactures candy and the need to use a substance that prevents the candy from sticking. The badatz requested using neutral talc which they supervise but the candy manufacturer insisted on corn flour. We will soon understand why. One of the reasons the mashgiach was surprised is that he is aware that using the corn flour leads to problems, resulting in the assembly line getting stuck from time to time. As he surmised would be the case, the assembly line came to a grinding halt after a number of hours of operation, albeit for a brief period. The following day the mashgiach noticed the assembly line never jammed, and this lit a red light in his head for he knows using corn flour will jam the machine periodically. Being a seasoned professional, he did not share his concerns but began prying around. He found the sack of corn flour being used and without telling a soul, he marked the level of the contents for future reference. He then saw the bag was almost empty and a subsequent inspection showed the very same bag was full, almost to the top. Needless to say he began realizing someone was playing games. He hid out for a while in the hope of seeing the employee who was filling the sack towards determining what he was filling it with and its origin. He nabbed the guilty party red-handed and it did not take long for the manager to become personally involved. Another member of the management team approached the mashgiach, requesting entry into the locked room containing the badatz approved ingredients. He explained that he forgot something unrelated to the production in the room. This room is closed and the mashgiach holds the key, maintaining control over the ingredients used in production. The mashgiach decided to play along, opening the room and permitting the senior official to ‘search’ for the missing item. While the search was ongoing the mashgiach dashed back to the place the corn flour was to be added and what did he find there? An employee was about to add an ingredient but when he saw the rabbi, he dropped it and ran. Understand that the mashgiach is still playing the game as if he does not suspect any wrongdoing. He understands appearing naïve will result in uncovering the truth. Magically the mashgiach’s phone rings and it is none other than a senior manager who begins talking about one thing or another. The mashgiach understands that he is trying to district him from events taking place at the time. As the conversation continues the mashgiach continues snooping around and he finds the ingredient that was being added instead of the corn flour. The replacement ingredient was a cheaper substance that does not have kosher supervision. Realizing they were caught, the managers tried another play to save the day. They now produce neutral talc but the mashgiach signaled it was too late and he was not buying it. Arrangements were made to complete the run and the decision was made to disqualify the factory from the list of acceptable businesses that will continue working with the badatz. Posted on April 1, 2014 by JKN Israel. This entry was posted in General Interest. Bookmark the permalink. 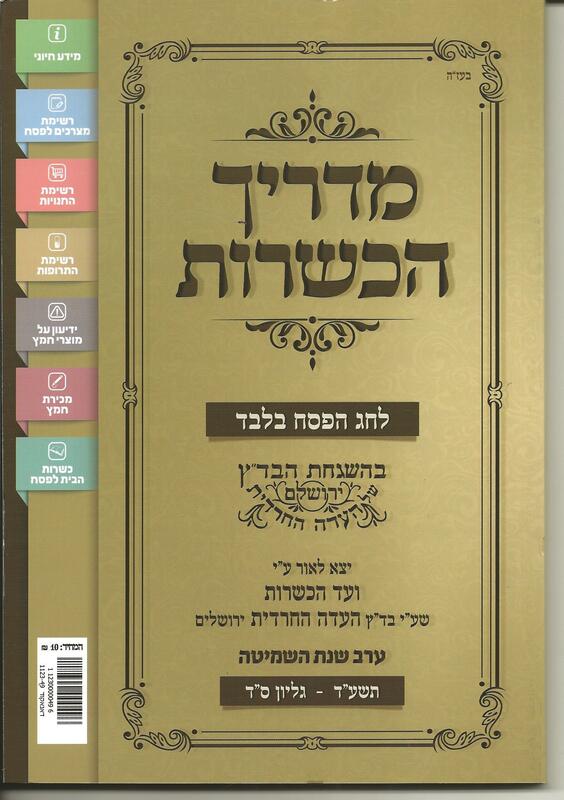 Is there a way to download the complete Badatz Pesach Guide? I saw the complete Badatz Pesach Guide at a magazine store and two local markets. It’s probably sold anywhere that Jewish content newspapers and magazines are sold. I think the guide cost 10 nis. It’s the size of a magazine; would be a lot to download. Ber — you can buy it in any seforim store for a few shekel. 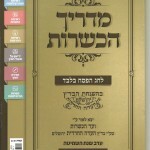 The Eidah Chareidis does not have a website or distribute its guide online.